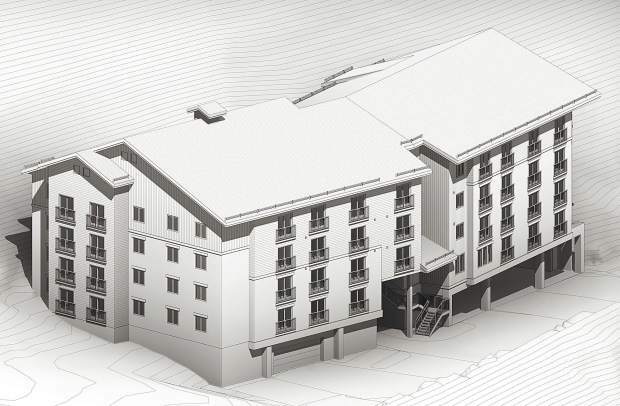 An artist’s rendering of the new Solar Vail appartments being built in Vail this year. Editor’s note: A verion of this story first appeared on the Vail Daily website on Sunday. Long identified as a critical problem in ski towns across the West, the lack of affordable housing in mountain communities has reached a crisis culminating in this week’s U.S. Mountain Community Summit Monday through Thursday in Vail – a ticketed confab of 100 impact investors, developers, land planners and business leaders working on public-private partnership solutions. The summit is a collaboration with Vail Resorts, the Vail Valley Partnership, RCLCO Real Estate Advisors and the Town of Vail. It features workforce and affordable housing thought leaders from 26 mountain communities. In 2017, Vail launched a plan call Vail InDeed aimed at deed-restricting an additional 1,000 units by 2027, bringing the total number of deed-restricted housing units (with restrictions on short-term rental and local work requirements for occupants) to 1,700. Ruther says the program is on course to meet those goals, even without a dedicated long-term funding source. Ruther addes he’s very interested in what Vail InDeed 2.0 will look like and whether its success can be duplicated in other ski towns from Sun Valley to Jackson to Lake Tahoe. And that problem has led to local businesses folding or scaling back services when they could actually be expanding if there was enough available labor, according to Ruther and representatives of the business community. Spencer says mountain towns need to band together because no one community has all the answers and no one company can offer all the solutions. Romer agrees that seemingly competing destinations can find strength in numbers and offer regional solutions that will benefit the entire outdoor recreation and mountain tourism industry. Spencer comes at the housing crunch with a global perspective, having grown up in Idaho and then traveled extensively after launching companies dedicated to solving complex problems from food security to water scarcity to infrastructure challenges in remote mountain communities around the globe that are “geo-fenced” by nature. Returning to Sun Valley to raise a family, she realized the severe housing challenges facing even middle- to higher-income people trying to find a way to live and work in mountain communities across the West. An “impact investor” friend then challenged her to find some innovative solutions. Thus began a six-month study that led to the first U.S. Mountain Community Summit. A former ski racer and a certified ski guide, Spencer discounts the notion of the “elevator pitch” in favor of the “chairlift pitch” to network and get deals done. There’s a heavy dose of that approach in the three-day summit schedule, along with the requisite panels and discussions. Those topics range from the potential of prefabs to incentivizing investment in aging resort real estate to new workforce housing solutions to innovations in impact investment. It’s a philanthropic mindset that’s aimed at improving a community with a lower, longer-term yield. It will take public policies coupled with that kind of private investment to solve the problem, Spencer adds, and she’s echoed by others versed in the workforce housing world. “From Vail to Gypsum, the Eagle River Valley community has prioritized bringing on new housing projects by thinking creatively and leveraging private-public partnerships,” said Kristin Kenney Williams of Commfluent Inc., a political affairs consultant and a member of the Eagle County Housing Task Force who’s helping to organize the summit. For more information on the first U.S. Mountain Community Summit Jan. 14-17 in Vail, go to the APX1 website.